A few days ago, my kids called me out into the family room. A marauder had figured out how to navigate up the side of the house and into our bird feeder that is hanging by suction cups from a window. “Impossible” task achieved, he draped his furry body halfway in, halfway out, and munched on the contents to his heart’s delight. The marauder was, of course, a squirrel. Though devoted backyard bird aficionados may pelt their computer screens with birdseed when they read this, I am quite fond of these hairy hooligans. They are a good “first mammal” for kids to study, since they frequently allow closer observation than other common urban mammals. There are two main groups of squirrels—ground squirrels and tree squirrels. This article focuses on tree squirrels, which live in—big surprise—trees. They live in cavities or in nests that they construct out of branches, leaves, moss, grasses and other material. They might use up to three nests at once and often construct several more in a given season. Squirrels are omnivores, meaning they eat both plant- and animal-derived foods. They are famous for their ability to store up food and then locate it later. Some scientists think squirrels mark their food with a scent to make it easier to retrieve. Others think they use spatial clues to help them remember where their caches are hidden. 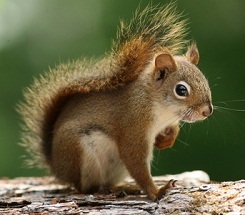 Female squirrels usually give birth to 1-2 litters a year. Newborn squirrels are blind and furless. Mother squirrels teach their young how to find food and water, how to build a nest, and how to avoid predators. Young strike out on their own at around 10 weeks (this varies from species to species). Tree squirrels are amazing acrobats. They have excellent eyesight and can judge distance well, which partly explains how they can make enormous leaps from one object to another. They use their tails for balance, allowing them to cross narrow ropes and wire as well as any tightrope walker. Squirrels’ acrobatic skills make them the bane of many devoted backyard birders. It is difficult to keep them out of feeders, as they can cross most any obstacle and gnaw through almost any material. Here in our backyard, we have adopted a come one, come all approach to bird feeding. We put several feeders out. That way if a squirrel or two comes calling, there are still some feeders left over for the birds. What foods do squirrels prefer? * Choose 3-5 foods you think squirrels may like, like nuts (unshelled), dried corn, apples, millet, bread, etc. * Have each family member hypothesize as to which food squirrels will prefer and why. * Set out each food in an identical way, either in the same containers or in piles lined up on a board or railing. Make sure you put out the same amount of each food. You don’t want the presentation of the food to determine which food the squirrels choose, just the type of food. * Observe your feeders as much as you can over the course of a few days. Using tally marks, record each time you see a squirrel eating a particular food. * Count up your tally marks to see which food squirrels like best. You can make a graph or chart with your data. * Collect the following: peanuts in the shell, dried corn on the cob, twine or string, a drill or screwdriver, long screws. * Screw a long screw into the center of the corncob. * Tie a string to the screw. * Make a string of peanuts by taking another piece of string and tying each peanut several inches apart. * Hang your corncob and peanut strings from a branch. * Watch to see what methods the squirrels use to get to the food. * This time, in addition to your corn/peanut strings from the previous experiment, you’ll need a thick rope (around 1-inch wide or more). * Tie one end of the rope to a deck railing, post, or tree. * Attach your corncob or peanut strings (or even a bucket filled with nuts) to the rope. * Can the squirrels get to the food? How do they minting their balance on the narrow rope? In an increasingly urbanized world, squirrels offer a little wild entertainment. Enjoy observing these amazing backyard creatures!